I remember saving for college by working at the McDonald's in Colville! I'm excited to hear they're joining the growing list of businesses across America that are raising wages and investing in their workers thanks to tax reform. Today in Spokane Valley I held my fourth town hall meeting this week – All of them have been completely open to the public. Listening is the first step to building a bridge and delivering results. I'm proud of the results I've delivered for Eastern Washington, and I'm committed to delivering more! And that all starts with listening to you. Thanks to those who came out, shared your concerns, and held me accountable. And a big thanks to KREM 2 News for live streaming! 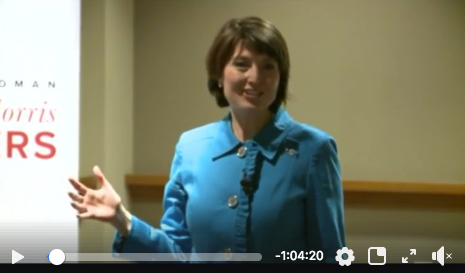 SPOKANE, Wash. - Campaign kick-off events for Cathy McMorris Rodgers broke records this week, with more than 1,100 supporters attending her Top O’ the Morning celebrations in Walla Walla, Colville and Spokane. I've had two fantastic days back to back! Yesterday I met with folks in Walla Walla and Dayton, and today I celebrated Top O' the Morning Colville! Less than 12 hours until Top O' the Morning Spokane... I can't wait to see everyone! The dams provide the lifeblood of Eastern Washington -- clean renewable energy, irrigation and recreation. I will do everything I can to stop the Democrats and federal courts from taking them away. Washington’s 2016 agricultural production totaled $10.6 billion! We must protect our farmers and small business owners by cutting red tape instead of burying them under regulations. Thanks to tax reform, farmers can expense any new equipment they purchase and take advantage of a 20% deduction on the first $315,000 of income. These are real steps to help the farmers of Eastern Washington. "Congresswoman Cathy McMorris Rodgers, with input from medical educators locally and throughout the nation, began drafting a bill to reauthorize the [Teaching Health Center] program in early 2017. Importantly, this new bill would double the funding level to more accurately support the actual cost of training a resident physician, [and] provide for more sustained funding..."
Thank you for the article, Dr. Bob Maudlin! It has been my honor to work with you and your team to protect and expand this vital service that helps our community and trains the next generation of doctors! Last night I was humbled by the support of more than 100 women from Eastern Washington. As the only woman in Congress to give birth three times while in office, I'm often asked, "how do you do it?" The truth is, I'm just like any other working mom – some days are more difficult than others. But, with family and faith, we persevere. Through laughter and tears, I was inspired by the women who shared their stories of resilience and determination. As mothers, wives, sisters, and friends we should always strive to build each other up. I'm blessed to have met Franklin Graham, Rev. Billy Graham's son. Thanking God for Billy Graham's legacy today. What an impactful life and inspiration!